The Rocky Mountain Horse is known by enthusiasts for its hardiness and ability to withstand winters in the mountains. 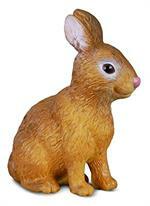 This stylish Chocolate Brown Mare with Flaxen Mane and Tail measures 18cm x 10.8cm. Captured in a gaited walk. CollectA' s lifelike, realistic Red Angus Bull will make a wonderful addition to any child's make-believe farm or barnyard play set. This handsome bull measures 4.7''L x 2.6''H. The American breed, the Morgan is distinctive for its stamina and vigor, personality, and strong natural way of moving. 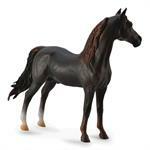 This stallion figurine measures 15cm X 12.9cm. The Styracosaurus has a bony neck frill surrounded and surmounted by a spectacular collection of horns and a single long nose horn. 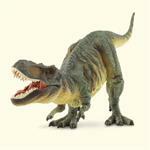 The Tyrannosaurus Rex had 50 saw-edged, pointed teeth up to 25cm in length. The skin was the same texture as an alligator but the colour is unknown. The Tyrannosaurus Rex was a carnivorous dinosaur from the Upper Cretaceous period. A unique ecotype of the woodland caribou subspecies, mountain caribou reside in limited numbers in interior British Columbia, western Alberta, northern Idaho and northeast Washington. Measures 5.45 in L x 2.50 in W x 4.91 in H.
CollectA Box of 12 horses. Comes in a clear, reusable carry case. Horses are between 1 1/2" and 2" long. BPA and Phthalates free. For ages 3 years and older. Deluxe 1:40 Scaled Model. The Iguanadon was a herbivore from the Lower Cretaceous period. It's name means "Iguana Tooth". Realistic dinosaur figuring measures 28cm x 11.4cm. The hands of the Iguanodon were very unusual the thumb was a spike.